Most indigenous people have very little money and live well below the poverty line. Our research identified the lack of basic educative tools, such as pens and paper as one of the chief contributors to the high drop-out rate of children in primary education. Since 2004, we have been providing free educational materials to the poorest indigenous children, enabling them to continue their education. To date, we have helped over 300 children across four indigenous communities. ECDO’s education activities originally focused on free Educational Materials Distribution, with the objective of increasing attendance rates and the number of children completing primary level education. However, the output of the program has only achieved a small proportion of its objectives. Monitoring and learning from this program found that free educational materials did not solve the inherent problems in education. One of the main problems was a lack of motivation and literacy of guardians which meant that children were not encouraged to attend school or able to gain help in completing their homework at home. When homework was not completed, they were often subjected to corporal punishment in school. To compound this problem, teaching was delivered in Bangla, which is not the mother tongue for most indigenous children. All of these factors acted as a deterrent for indigenous school children to regularly attend their local primary school. Following this discovery, we implemented a new initiative to remove these problems for indigenous students. 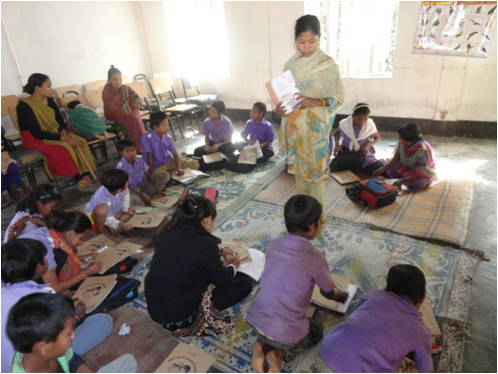 In January 2006, we implemented a pilot project of four Education Support Centers (ESCs) in two Khasi Punjee (Mokam Punjee and Jaintapur). The pilot project was developed following numerous focus group discussions and meetings with community members, using a participatory approach to design a strategy to deal with education problems. The Support Centre is open from 7am- 9am every day (except weekend days) to help children complete their homework. It is run by a locally recruited indigenous teacher. The ESCs are supported by a committee composed of local community leaders and members who oversee the running of the centers. Following the establishment of Education Support Centers, the attendance rate among the indigenous children significantly increased. Currently 135 children attend four ESCs. Their capacity is for thirty students, but due to their success they are heavily oversubscribed. We are trying to expand the program and are searching for funding to enable us to do this. If you are interested in finding out how you may be able to support ECDO’s education work, please contact us. We are continuously advocating for quality education for all children. We recognize that parents play an important role in their child’s education, and our regular guardians meetings are an integral part of our ongoing efforts to raise awareness of the importance of education, and help to encourage parents to keep their children in school. We also target local government through our advocacy efforts, and lobbying, which has resulted in the recruitment of indigenous teachers for schools in remote indigenous areas. One of the key contributors to the high illiteracy and drop-out rates amongst indigenous students is that mainstream teachers provide education in Bangla. Indigenous children are disadvantaged as they converse in their mother tongue, and are not fluent in Bangla, thus affecting their ability to process lessons and complete school work. By recruiting indigenous teachers, indigenous children can receive education in their mother tongue, making it easier for them to absorb knowledge, and continue their education. We are now focused on strengthening school systems to ensure indigenous children have greater access to bi-lingual pre primary and formal education. Our lobbying has also benefited indigenous students in higher education. Prior to 2010, Shahjalal University of Science and Technology had no designated quota for the admission of indigenous students. For many years, we lobbied the local government, and pushed for the introduction of an indigenous student quota to make higher education a more attainable goal for marginalized individuals. In 2010, Shahjalal University introduced a specific quota for the admission of indigenous students: two indigenous students per department, equating to approximately 50 indigenous students per year.